I continued the whimsical theme that I started in the family room in the kitchen. If you missed it, you can see more of that decor here and here. The table in the kitchen is all set for breakfast on Christmas morning. I picked up this cloche at HobLob (with coupon a of course!) a long time ago, but this is the first time I’ve ever used it. 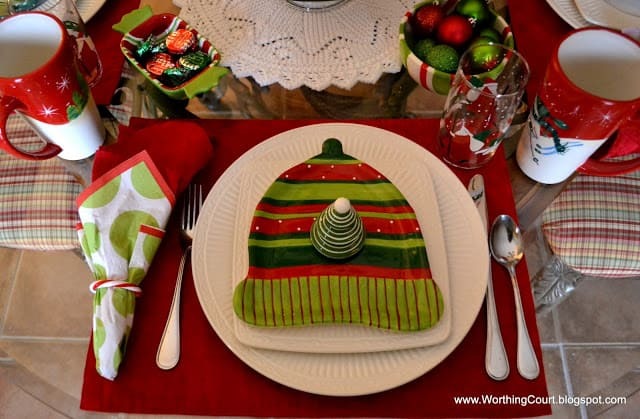 Obviously, it was easy to decorate – kosher salt for snow and a Santa tree topper sitting in the middle. 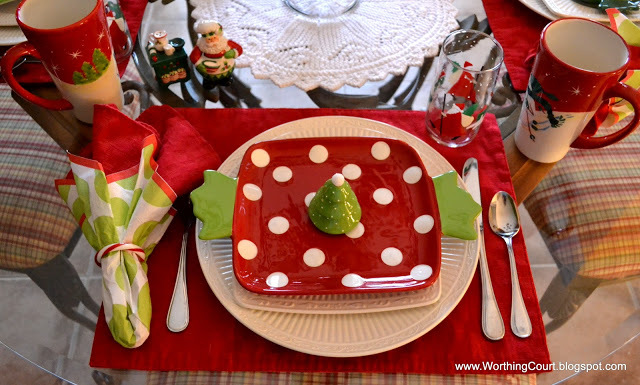 I used my much loved Mikasa Italian Countryside dishes as the base for the place settings. The crisp white of the dishes looks so pretty against cheery red placemants. 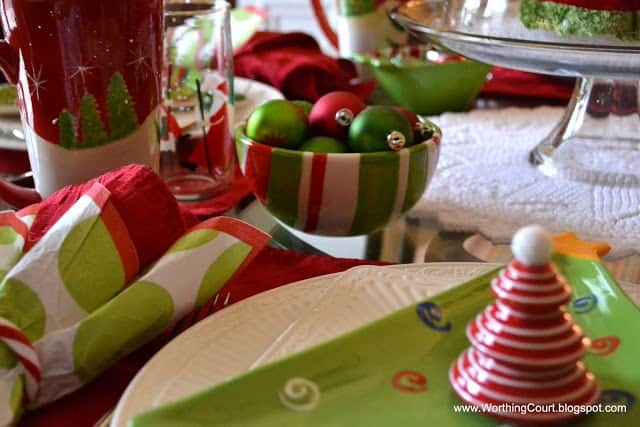 Matching red cloth napkins were wrapped with green polka dot ones, held together with candy cane napkin rings. Did you notice those cutey patootey glasses? I recently purchased those from Savannah Granny’s etsy shop called Savannah Secret Cellar. They fit into this tablescape perfectly! Most of the dotted and striped dishes came from Walmart a couple of years ago. When I saw them, I snapped up everything they had left. The rest of them were picked up here and there. The Santa and his stove salt and pepper shakers are Fitz and Floyd. Love me some Fitz and Floyd! I put together a collage of each of of the place settings, but the pictures were too wide, so here’s an individual pic of each one. On the island, I used my Fitz and Floyd Santa cookie jar and decorated a small tree that I already with little red ornaments and some ceramic spoons that I picked up last year at Caryl’s Christmas Shop. Santa – this one is holding a chalk board that my granddaughter, Miss M, wrote a message on. I had the platter made a couple of years ago at a local home decor shop. 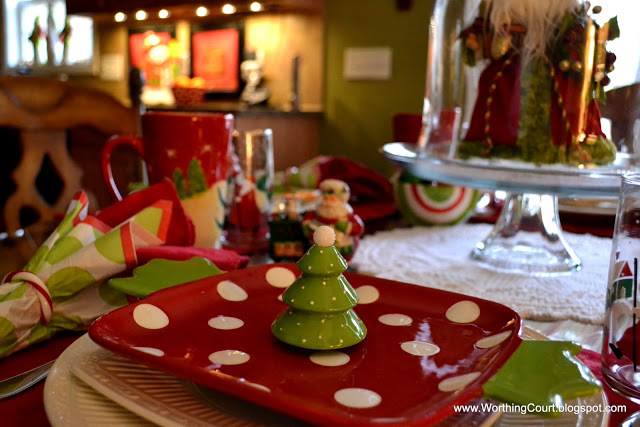 Across the kitchen, I just have a few Christmasy dishes on display. 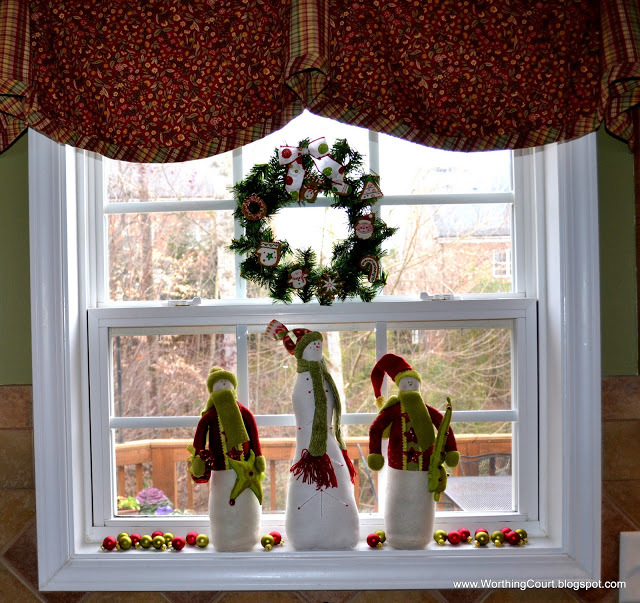 The last vignette in the kitchen are these snowmen and a wreath above my kitchen sink. I scattered some small ornaments on the window sill with the snowmen for a little added interest. 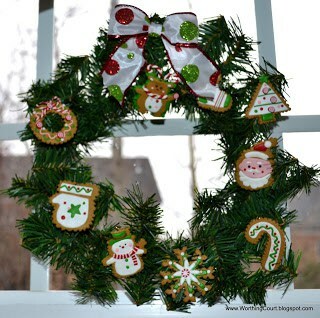 The wreath is made from a piece of leftover garland twisted together. I thought the gingerbread looking ornaments were perfect for my kitchen. One of my favorite purchases this year, is the apron hanging on the side of the refrigerator. I found it at Ace Hardware of all places. Can you read what it says??? Merry Christmas Y’all from my Christmas kitchen to yours!!! I love the whimsical look you have going on. I love fitz and floyd too. I really like your blog. I saw your link on At The Picket Fence. Come visit me anytime at Hibiscus House. I am now one of your followers. Your home looks incredible, Suzy! I love your Christmas decor. Everything is so fun and festive. Oh my Goodness – what an adorable kitchen ! You can’t help but be happy just looking at the pictures !!!! 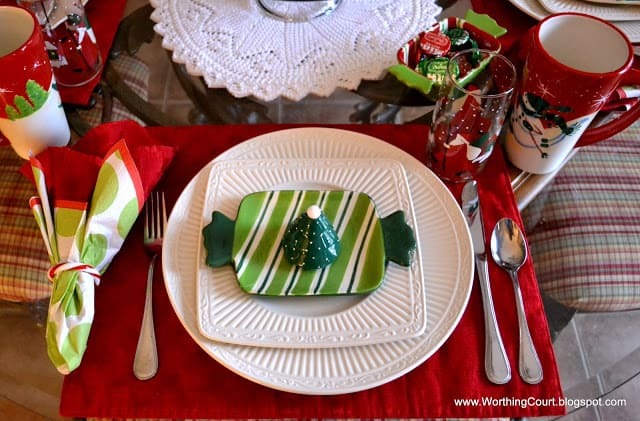 What fun Christmas table settings! 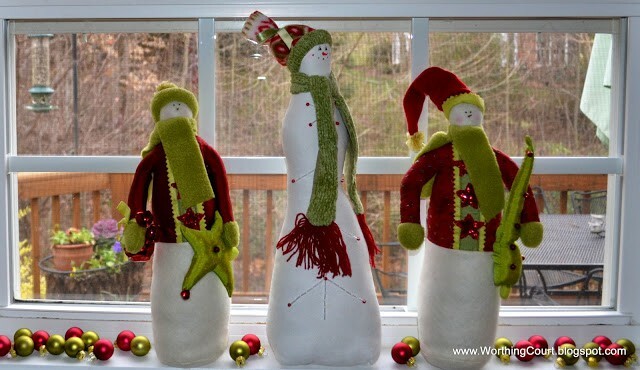 And I love the sweet snowmen on the window sill. 🙂 Thank you so much for stopping in at Cranberry Morning today. Have a blessed Lord’s Day tomorrow. 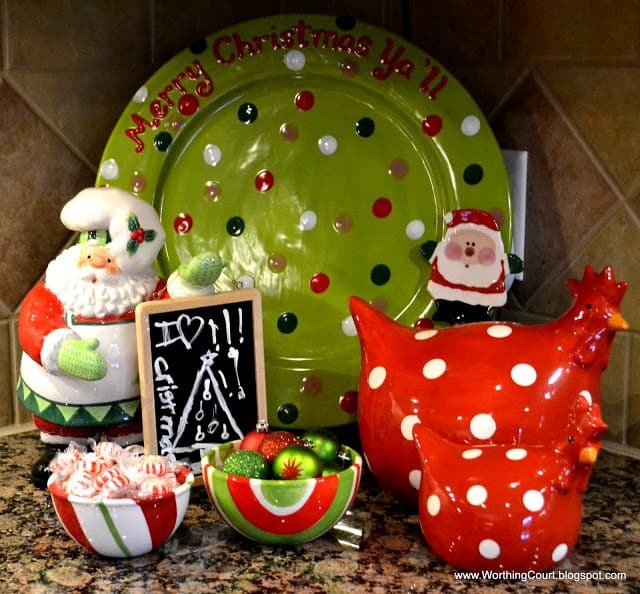 What a fun, festive and whimsical Christmas kitchen! Anyone who enters will certainly leave in the Christmas mood. 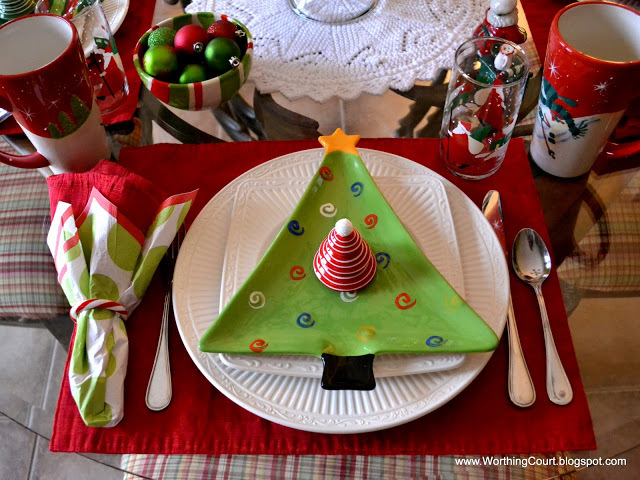 Your pieces are so cute … love the tablescape, too. 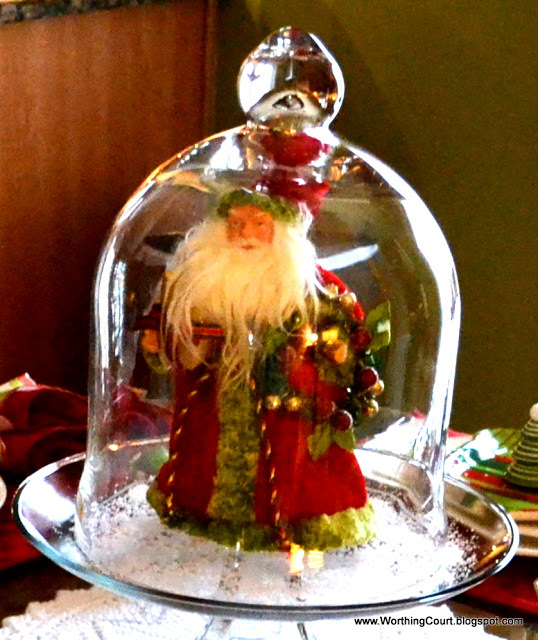 Santa under the cloche is the perfect centerpiece. I have a few of those pieces, too! Such fun dishes! 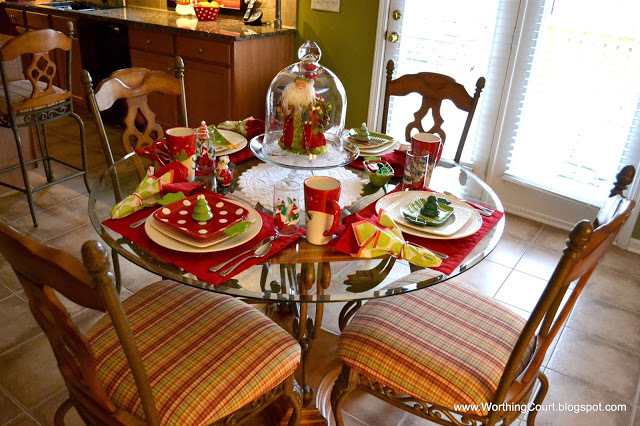 The kitchen in my last house was that same green with a “Foxy” red dining room and was so easy to decorate for Christmas. 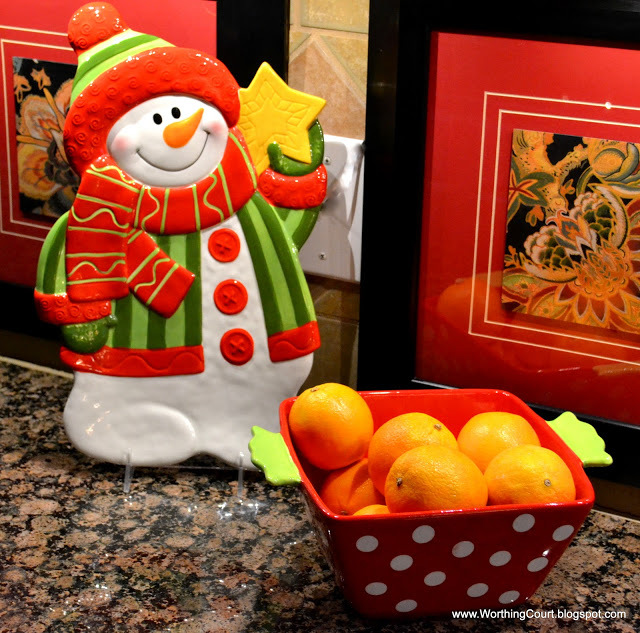 You asked about the snowman plate my mom bought me in a comment on my blog and it came from Marshall’s. She bought me the small plate last year at her Marshall’s but I was able to get a larger one at my Marshall’s last week so they are still out there! 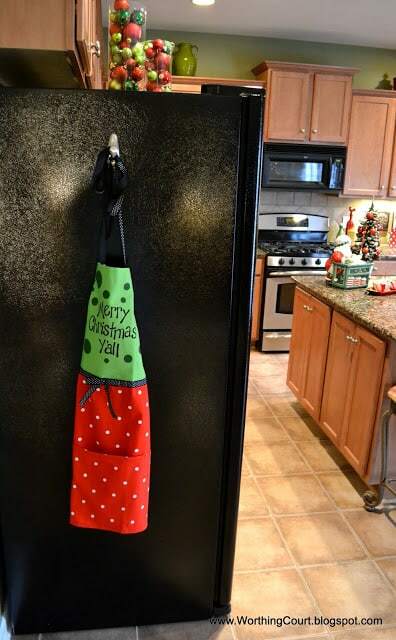 I love your Christmas kitchen and your dishes are darling. I saw those at WM and so regret not buying them! I also love your little vignettes and have got to tweak mine a little in my kitchen. Yours are such an inspiration. 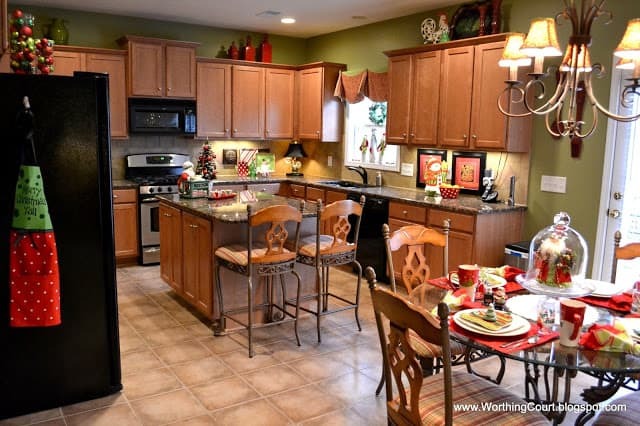 Your Christmas kitchen is stunning! I love every single thing you have used and the colours are so festive and cheery! Your whole home is so warm and festive-I love it all! 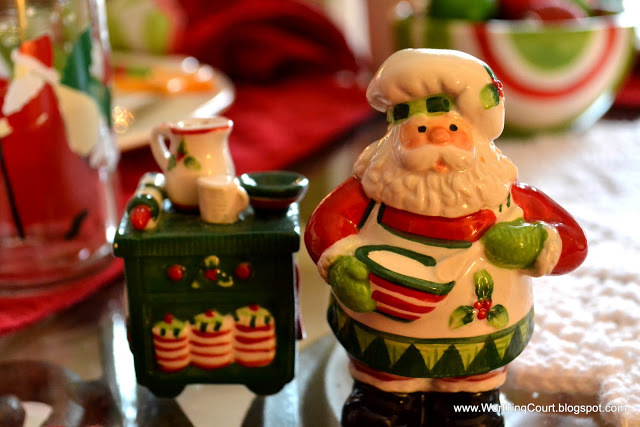 I am hosting a Christmas linky party at my Christmas blog-please pop by if you have a moment! I would be so honoured if you could join in and link up! Your dishes are so fun! Love the colors, too. Charming Christmas all around! Loved the look-see. I love it all and wish I could see it in person 🙂 Love the polka dots, love the little items on each plate, love the little plates, the glasses … love all the Fitz and Floyd are you kidding me I love it!!! Thanks for sharing! This green kitchen is just so perfect for Christmas. I am rethinking the green in our family room or as we call it “the green room” I really like the green in your kitchen. Do you remember what it is? As for the decor it is all totally fun and I was surprised, I have never been a huge fan of snowmen. I think I always think of them as a bit too country but I really liked your… the updated version. :0 Again, thanks for the link up to Motivated Monday. Oh my goodness, Suzy, your whimsical kitchen is A.D.O.R.A.B.L.E.! I really like that lime-green color with all the reds and whites — it’s so fresh-looking. Everything looks amazing. I’ll bet your little “Grands” just love it! Love all the colours. I especially love the christmas trees. I love whimsical! 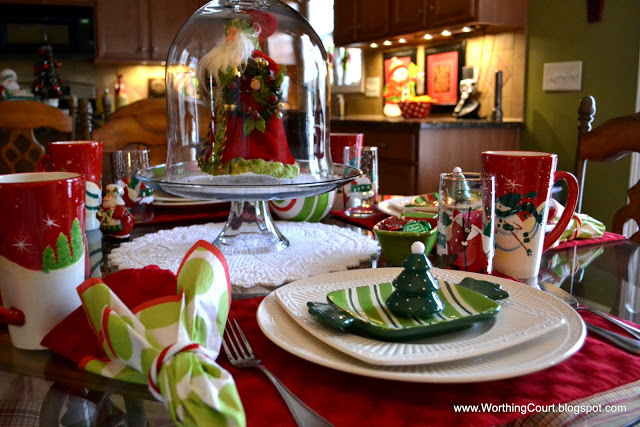 Your table is so pretty with the Santa in the cloche. All the other items coordinate perfectly and are charming. I especially loved your snowmen in the window with the gingerbread wreath. Merry Christmas! I’m your newest follower linking over from A2Z. 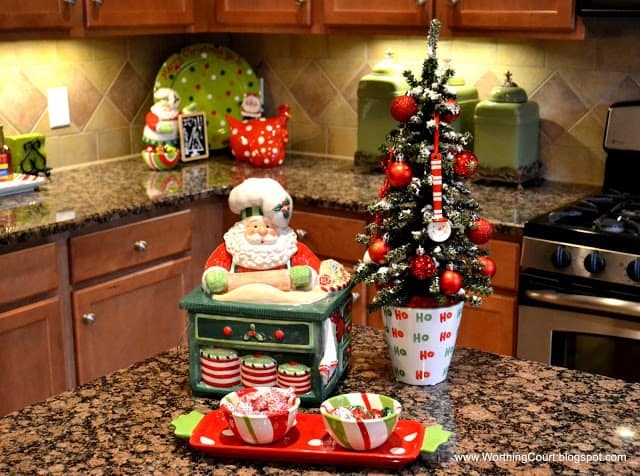 Your kitchen is adorable, and I am looking forward to checking out the rest of your home and Christmas decor. I have owned my own drapery workroom & decorating service for the last 10 years and just started blogging about my projects this fall. I am anxious to learn from all of your inspiration and tips! Your kitchen looks wonderful and the table is adorable! Thank you for sharing the season and your beautiful home at Potpourri Friday! May you have a Merry Christmas and the Happiest of Holidays! Can I use one your photo for a christmas card cover please?